VERSAILLES – In advance of the upcoming festival, and to allow parade and festival preparation, the Poultry Days Board shared the 2019 theme artwork. 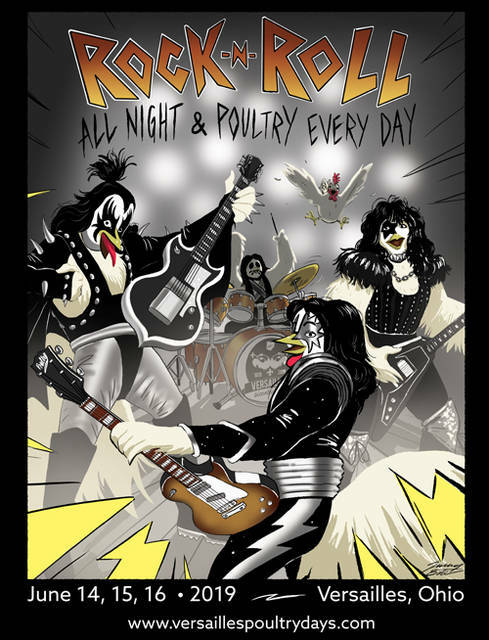 The 2019 festival theme is “Rock -n- Roll All Night & Poultry Every Day!” It’s based on early 1970s hair bands and rock ‘n’ roll with a poultry twist. The 2019 artwork was created by local resident and Versailles High School graduate Quincy Baltes. He is studying animation and story boarding at the Savannah College of Art and Design in Savannah, Georgia. Baltes also is exploring the worlds of motion media, illustration, sequential art and performing arts. Along with Baltes’ work on the theme artwork and festival logo, another local graduate has been supporting the festival. Morgan Turpen is a 2015 graduate of Versailles and studying graphic design under the University of Cincinnati’s DAAP Program. Turpen recently opened her own business, Turpen Design, and contributes her time to designing festival signs and graphics. Ben Ahrens is another Versailles alum and also a graduate of Ball State University. Ahrens has worked to support and update the festival website. The 68th annual festival will be held June 14, 15 and 16 in Versailles. One of Ohio’s oldest festivals, this event celebrates the area’s poultry-producing history as well as its sense of community. The board welcomes everyone to come enjoy the festival. Registration information for the parade and other festival events will be posted as available at www.versaillespoultrydays.com.